Disneyland in Anaheim, California has many off-site hotel options within walking distance to the Disneyland parks (unlike Disney World). We had previously stayed at the Howard Johnson Anaheim Hotel and Water Playground (which was well run, clean, but not updated). 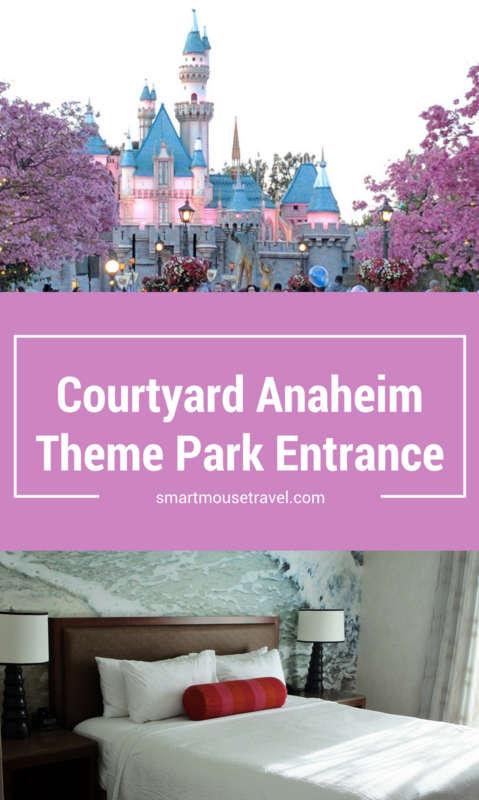 This time we opted for the newest hotel on Harbor Boulevard – Courtyard Anaheim Theme Park Entrance. Courtyard Anaheim Theme Park Entrance is located within a few minutes (less than a 10-minute walk) to Disneyland and Disney California Adventure, and you only need to cross one major street to reach the parks. The location of the hotel made getting to the parks quick and easy. On the walk to Disneyland from the hotel you pass Mimi’s Cafe, Panera, and McDonald’s among other quick and inexpensive food choices. There are several room types at Courtyard Anaheim Theme Park Entrance, all of which have bunk beds, a mini fridge and microwave. There are several room sizes to choose from to fit many family sizes and budgets. On-site at the hotel is a casual restaurant and bar, but no free breakfast or happy hour. A large gift shop has basic essentials in addition to Disney themed clothes and gifts. Included in your stay is access to the hotel water park. The water park looked like a lot of fun, but it was too cold during our visit. We stayed in a standard room which included a bunk bed, a king size bed and theme park view. Although not a suite, it provided a lot of space. Once you enter our room there was a small room off to the right that held the bunk beds. If you go to the left down the hall you find a large bathroom and main bedroom area with a corner booth. The bathroom has a double vanity and two separate showers. There was a stand alone shower with the toilet in one room and then the tub/shower combo in the room with the sinks. This large bathroom made getting ready at night and in the morning very easy. In the main bedroom area is a king size bed, a corner booth for dining, a large desk with a chair, Netflix enabled TV, Keurig coffee maker, mini fridge and microwave. This eating area, coffee maker, and mini fridge saved us money and time by allowing us to eat breakfast in the room. We ate breakfast in the room each morning except when we went to the awesome Minnie and Friends breakfast at Plaza Inn. Having the kids’ sleeping area down the hall from the main bedroom area was awesome. We could get ready or watch TV without disturbing Elizabeth if she was sleeping. Added bonus – we had a theme park view room with a balcony which allowed us to watch the Disneyland fireworks from our room one night. Somehow I booked another valet-only hotel. The price for valet is $20 plus 17% tax when we stayed. This price included unlimited in-and-out privilege. Our room worked out perfectly during our visit. The kids sleeping area away from the main room was a nice feature. We also liked the large bathroom, the dining table, mini fridge and easy walk to Disneyland and Disney California Adventure. The room design and short walk to the parks (in addition to bunk beds) make this a great family friendly hotel choice. My only concern is that the rooms, although new, are starting to look a little worn. I hope the management maintains the hotel well over the coming years. Next Post:Is Mickey’s Not-So-Scary Halloween Party Worth The Expense? we are also brand loyal to Marriot so will check this out for sure! I cant wait to go to Disneyland!